Eight concrete artists’ innovative designs created a buzz during the September Concrete Décor Show’s inaugural Brawl in the Fall event, designed to show the latest and greatest developments in decorative concrete. 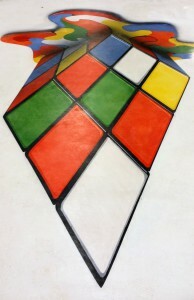 Using a flat concrete overlay as a canvas, Knigge-Bruce used stencils and concrete dyes to create a warped-perspective Rubik’s Cube that took on a three-dimensional effect from certain viewpoints. It was one of her first attempts at the technique, though she has been working with stencils to create concrete art for more than five years. Knigge-Bruce chose a Rubik’s Cube because of its relatively simple lines and shapes that require less shading and detail. Until she is more familiar with the process and the warped shading involved, she has focused her efforts on simple objects. If she were to create a scene with realistic creatures climbing out of the earth, for instance, every detail would require shading, which would be drastically warped, to ensure the desired effect is created. To those unfamiliar with the process, however, it’s difficult to see how much more perfecting Knigge-Bruce needs to do. The cube pops off the surface, leading the viewer to think a giant Rubik’s cube is sitting right in front of them. Overall, it took a total of 13 hours to complete the project, Knigge-Bruce said. The design needed to be planned, stencils needed to be cut and the art needed to be installed – which alone took approximately 7 hours. 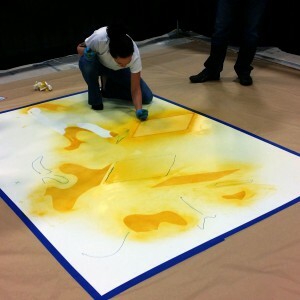 To get the vibrancy needed for the cube’s many colors, Knigge-Bruce used Nox-Crete’s Duro-Color Dyes, which she first used at the 2014 World of Concrete Convention. Knigge-Bruce says anyone can do what she does. More often than not, the designs that she sells are basic logo designs. These require very little skill to install and involve only solid colors. The airbrushing and shading that Knigge-Bruce incorporates in many of her designs are for those with a little more experience. Looking at her work, one isn’t so sure that’s true. This entry was posted in Decorative, Project Profile and tagged Colored concrete, concrete art, decorative concrete, Duro-Color Dyes, Rachel Knigge-Bruce on October 17, 2014 by Aaron Nussbaum.